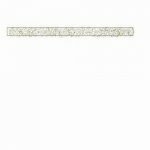 Quilting Ruler 2 1/2" Strip Ruler made for Bali Pops Jelly Rolls Story Strips, Roll Ups, Personally cut 2 1/2 inch quilt fabrics cut into any length needed. Cuts up Jelly Rolls Bali Pops Story Strips Roll Ups Personally cut 2 1/2" Quilt Fabric Strips etc. Ruler marks from 1/8" to 13"
Peel paper off the two pieces of acrylic. Lay the orange small square beveled side away from ruler in between the ridges on the one side of ruler.